Since Spud and I are definitely more into eating than drinking, we tend to forget that bar food can sometimes make for really satisfying cheap eats. 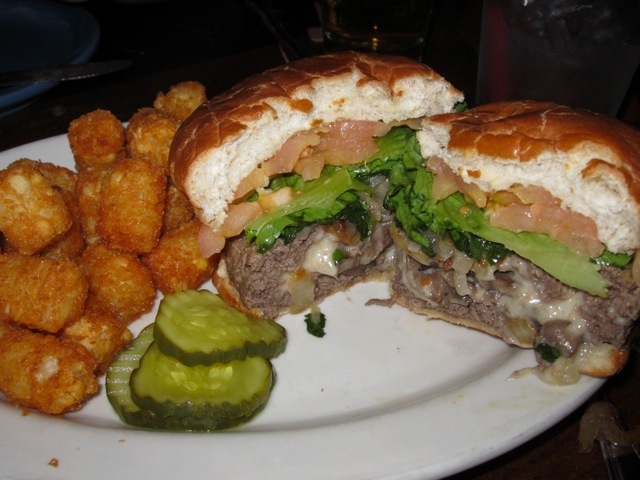 The Stumble Inn, an Upper East Side sports bar is not a culinary destination, but it does serve a very good signature stuffed burger. This sloppy burger comes with several variations: The Cheese Monster, The Spicy Stumbler, and the The Second Avenue Stumbler, with swiss and sauteed mushrooms, which we ordered, topped with sauteed onions. The stuffed ingredients kept the sirloin burger really moist and packed with flavor. It was $10.95 with tots, but probably under $10 without. And if you want a deal, on weekdays from 11:30 am until 4 pm, get a free draft beer or soda with any stuffed burger. With its wooden booths and tin ceiling, Stumble offers a warm, winter setting, plus it’s a sports bar, so you can let loose and be as rowdy as you want! The Modern has the The Modern, The Guggenheim has The Wright, and now The Whitney has Untitled. 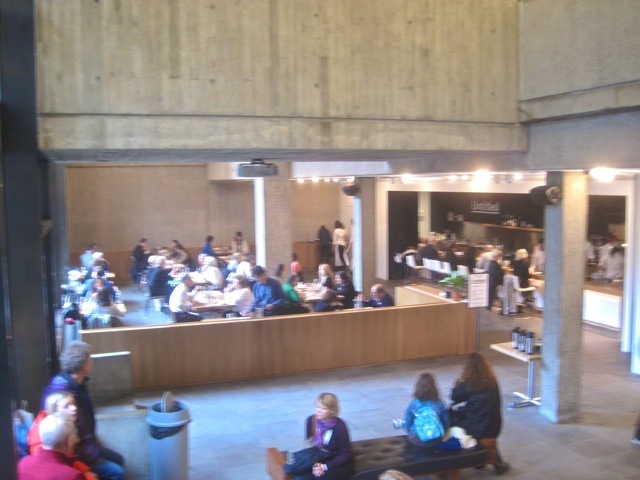 While the first two seem to be formal and staid (although I haven’t been), Danny Meyer’s new place, elevates the museum cafe to his impeccable standards, but still remains a cafe. You can sit at the counter and order a doughnut and coffee or an egg sandwich. Now this review is a few weeks old, and I visited during the soft opening, with only a partial menu, and a host that clearly had no clue. But only the food mattered, of course, and what I had was so simple, yet so delicious. Since the Whitney celebrates American art, I chose to celebrate a day off with two American classics: a BLT and cherry pie. They were both extremely satisfying. 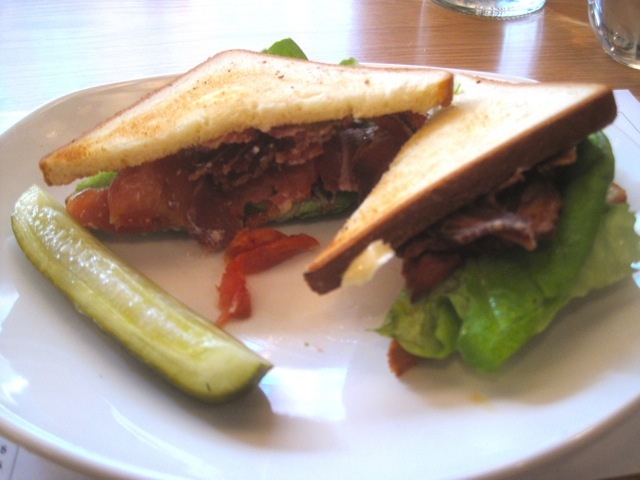 I usually dismiss the limp bacon, lettuce and tomato, but this one had perfectly crispy bacon, not overly smoked, and the bread was soft white, with perfect proportions. But it took me a few bites to decipher why this simple BLT tasted incredible, it was the tomatoes! They were perfectly ripe and sweet and possibly marinated, but they were just beyond a tomato. And the pie was from a local source, as is nearly everything at Untitled. Four & Twenty Blackbirds, from Brooklyn, is known for their amazing pies, and this one was just that. 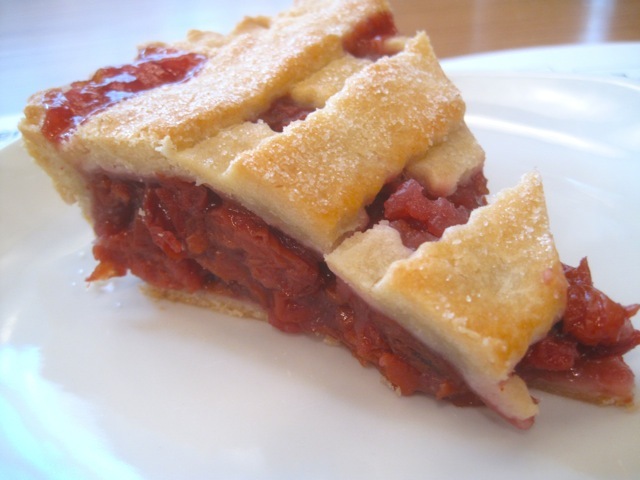 The crust was rich and flaky, the cherries sweet and plump. It was damn good. Good enough that I’m going to trek out to the Brooklyn shop real soon. Like everything Danny Meyer touches, Untitled is exceptional. Now that dinner is being served, I will have to return. This will definitely be a destination on the Upper East Side, with the museum almost an afterthought – and it’s a really good museum. 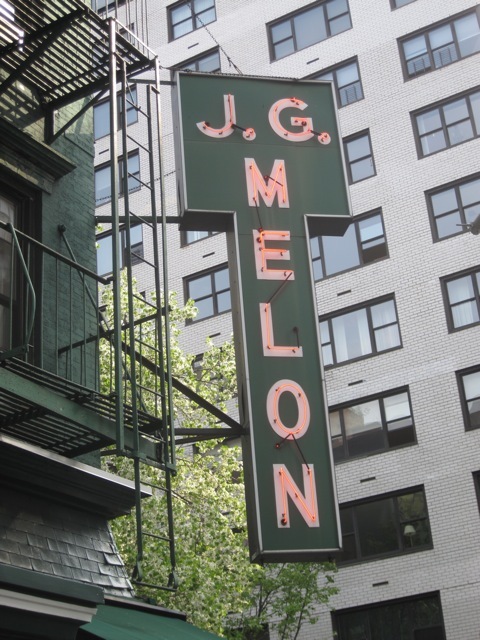 It has only been around since 1972, which is an eternity in NYC, but J. G. Melon feels more like an 80 year old. It’s a little tired, very much set in its ways, but is still reliable day after day, decade after decade. 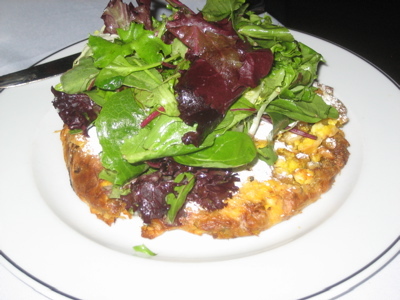 It is a preppy Upper Eastside institution that has its diehards – ask Bobby Flay – it’s his absolute favorite. Melon does make a very good cheeseburger. The bun is soft and squishy and unseeded. The beef, a sizable patty, not too much, not too skimpy. 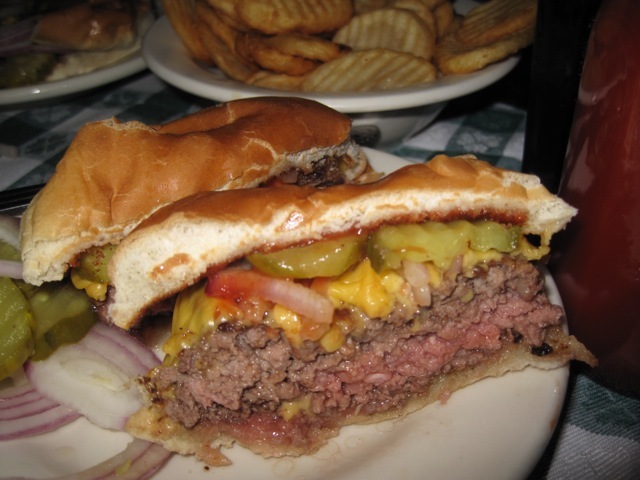 It is classically dressed with a fully melted American cheese slice, chopped onions, tomato and pickle slices. The ridged cottage fries are tasty too. It’s always packed, the service is borderline surly, and room hasn’t been updated in, maybe forever, but you will still come here and get your beer and burger. With the whole city burger craze, there are better places, but this grandfather will be here long after the others fail in their infancy. Long live Melon! 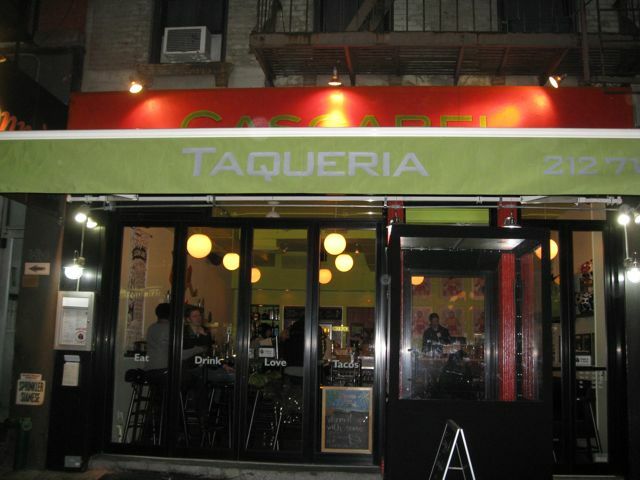 Simply stated, I really want to like Cascabel, there’s nothing really wrong with it, but I just can’t seem to put my finger on why I wasn’t happier there… Cascabel is a little storefront taco place on 2nd Ave that opened a few months ago. 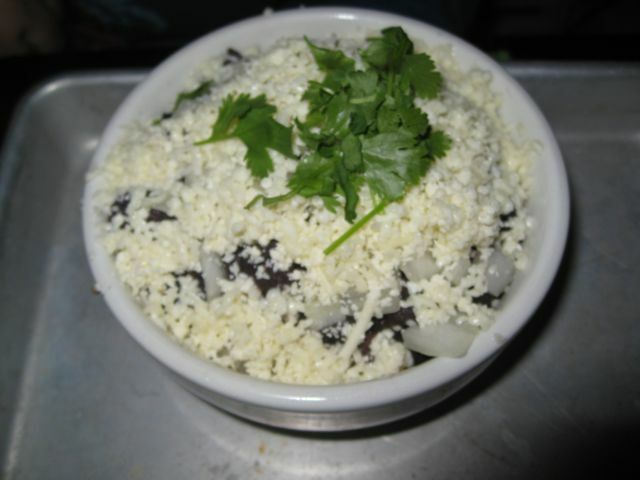 The food is good, the signature tacos are quite flavorful and tasty. We tried two standard ones: the camaron and the carnitas. 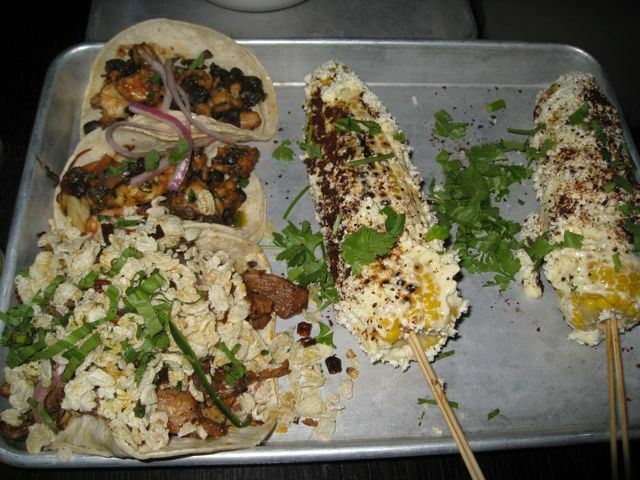 Both the shrimp and the pork were cooked well and the tacos were well-dressed with high quality versions of the standard taco fillings. We tried the rich cheese slathered corn on the cob, and the quinoa and beans – an upscale, healthier version of the standard rice & beans. 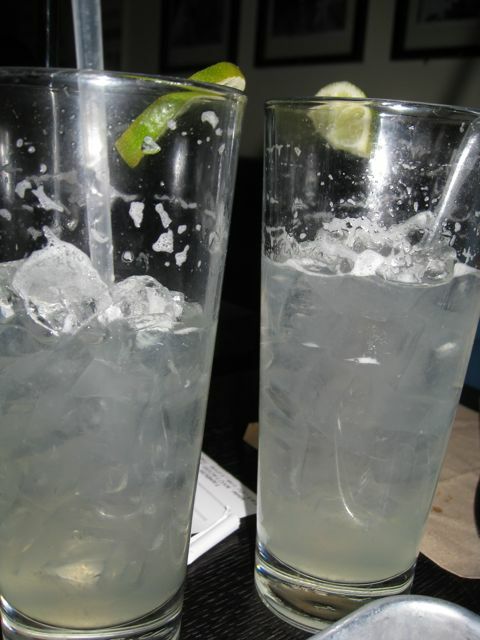 The fresh squeezed lime aqua fresca was delicious and refreshing. So the food isn’t the problem here. It’s not cheap ($7.50 for 2 tacos), but certainly a good value for the neighborhood. The patron orders at the counter, and the food is delivered at the table, and drinks are refreshed by a server, all of whom are helpful. 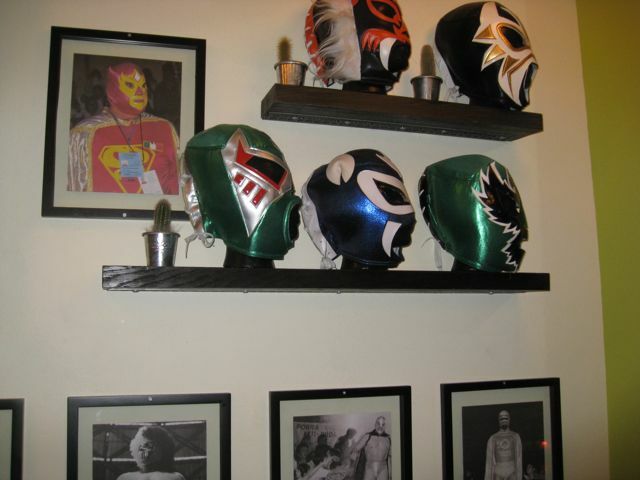 I even really liked the decor of the Mexican wrestlers, which provided a unique Mexican vibe. The seating was one problem, because it’s a tiny place with only a few tables, so I felt a little cramped and rushed, plus people waiting for tables are standing over you. But I guess overall, I think my main gripe is that it’s just too contrived. It’s not authentic. It’s just a little too well-executed for a “taco stand”. But I guess it’s an Upper East Side version, so while it isn’t my favorite, I’m sure most people in the area will love it. And if my arm is twisted, I’m sure I’d return for a few tacos and cervezas. Warm Bar-B-Q on the Chilly East Side…. Again, as all of you know, I am not a big fan of the Upper East Side around Lexington. 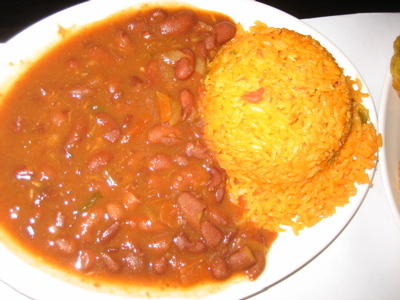 Its restaurants definitely lack good grubhub food and prices. My standards are different for this region of Manhattan, so I’ve found that when we find a place that serves great food, even if it’s a little more pricey than usual, we are shocked and pleasantly surprised. I think this has to do with the fact that you usually pay a lot more here for sub-standard eats. We were recently very surprised with Smokin’ Q, a new Bar-B-Q joint. It’s really cute, with wooden benches and red and white checkered table clothes……you almost forget where you (almost, until you notice all of the button down shirts with sweaters and khaki-pantsed pinched-faced UES-ers) Now, it is not cheap, but you certainly get what you pay for. 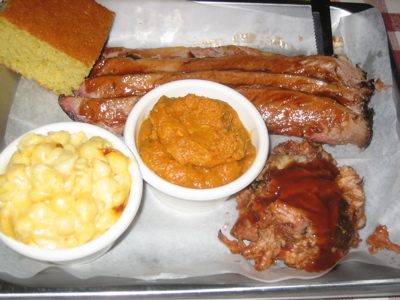 A large plate of BBQ with two sides and a drink will run you around $22-25, depending on what you order, and since you place an order at a counter, you do not have to pay the 20% tip for service. Also, the servings are quite large, so you can definitely comfortably get away with sharing a large BBQ plate. 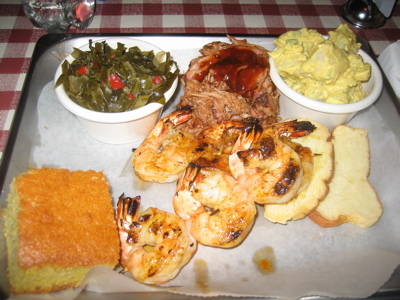 The Hubster had the pulled pork and the BBQ shrimp with collard greens and potato salad. I indulged in BBQ brisket and pulled pork with mac -n- cheese and sweet potato mash. 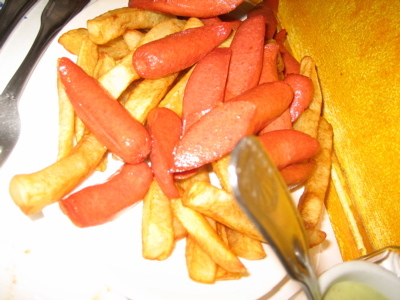 The portions were very large…..we both couldn’t finish the food, and not only that, it was GOOD…..real good, in fact. The brisket was some of the best I’ve ever had, with just the right amount of BBQ sauce and the pulled pork was moist and flavorful (albeit slightly fatty). The Hub’s shrimp was incredible…..large sized and perfectly grilled……and they gave 6 of them! The sides were tasty…..the collards were definitely vegetarian, which was slightly disappointing, the mac-n-cheese was creamy and well-baked, the potato salad had a nice mustardy sauce and the sweet potatoes were a bit bland, but a nice sweet addition to the meal. We really hope this place makes it…..it was a nice respite from all of the other over-priced joints surrounding it! The owner was there immediately greeting us, and he seems like a real nice guy just trying to serve some BBQ! They also have a great $10 lunch deal which includes a BBQ sandwich, drink and side. 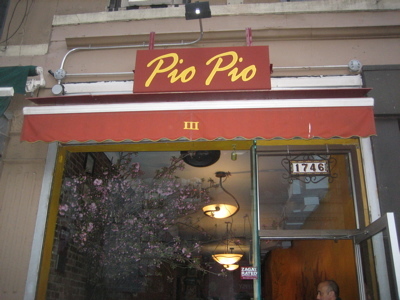 Pio Pio has been around at least eight years, but lately has expanded its locations to around Manhattan, Queens and the Bronx. It is no surprise why its popularity has grown, it has a casual atmosphere, inexpensive food and drinks, and an interesting (but not intimidating) menu. The 1st Avenue location is long and narrow with cramped seating that no one seems to mind once the large plates of grub arrive. 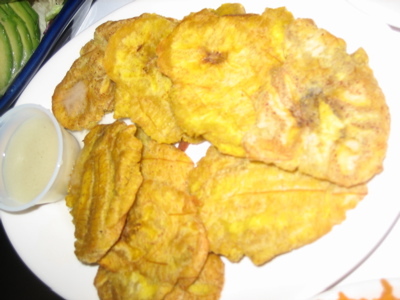 We ordered the Matador Combo which consists of a whole chicken, and large plates of rice & beans, salchipapa (franks and fries – odd combo, but tasty), tostones, and avocado salad. 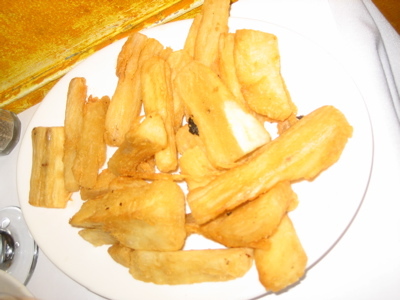 It is enough for 3-4 people, which obviously isn’t quite enough for us, because we also had to have the yucca fries. Luckily, there were other couples with 7 plates covering their small table as well. Everything was tasty, although all the fried foods together were a little overwhelming for us. 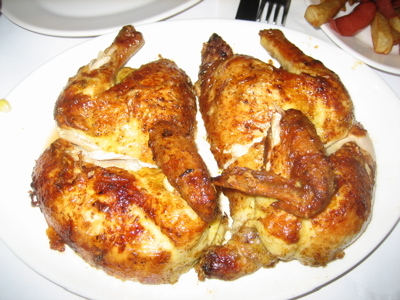 The chicken was juicy and flavorful, although it had a slight aromatic flavor which was not quite as appealing as some of my favorite chicken joints. I will definitely return again and order more sensibly and get some of the good looking sangria. My co-corker, Aliyah, who is a regular, recommends a quarter chicken each (with awesome spicy green sauce) and sharing two sides. That sounds pretty good to me. While Pio Pio does not quite deserve a Golden Bozone, I do love my chicken-on-the-bone, and this is a great place to get it. 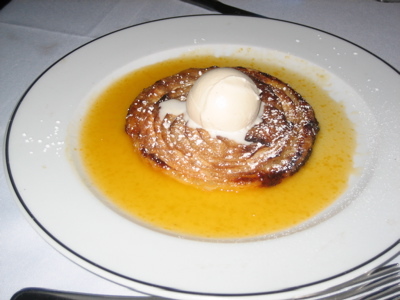 We don’t eat on the Upper East Side very often nor do we dine at French restaurants, but we enjoyed our experience at Brasserie Julien very much. We met my brother and his family for dinner and had a spacious table in the back of the restaurant. The ceilings were high, and the colors rich, but not opulent and the room had a comfortable, airy feel. The menu was excellent, with a wide variety ranging from the classic onion soup and pate, to mussels and frites and bison burgers. 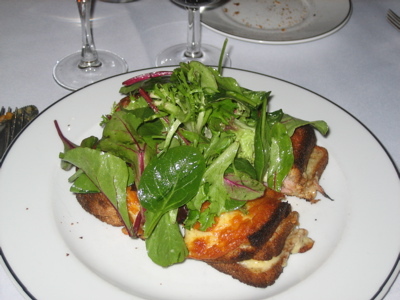 French Bistro food is completely different than Haute French food, and truthfully, we enjoy it much better. 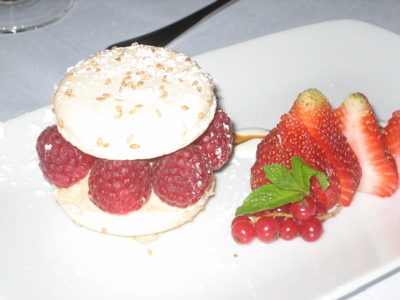 Bistro food has bold flavors, large portions and simple ingredients – the prices are quite less as well. Spud and I share the duck foie gras as an app. Spud loves duck liver pate, I don’t, but this was quite good with a little chutney on crusty toast. I got the croque monsieur, for the first time, and it was delicious. It’s basically a really rich grilled cheese stuffed with ham and loaded with tons of high quality melted cheese. I couldn’t even finish. Spud ordered the Morroccan Chicken Bisteeya, a dish with phyllo layers filled with chicken and vegetables and Morroccan spices. It was also quite tasty. My niece, Jamie, ordered the fillet mignon which she enjoyed. She has a great appetite and likes a wide range of food, which is spectacular, especially for a teenage girl. Our very positive experience at Brasserie Julien has made us want to explore other French Bistros and the variety they have to offer. This place is a neighbor eatery for the UES and I thank my non-foodie brother for turning us on to it. Follow Me to the Cafe…. After working on the Upper East Side for the second year in a row, I’ve come to realize that lunch options are ridiculously over-priced and hardly appetizing. Sure, I’ve found a great local coffee shop by Hunter College that makes wonderful chai lattes and has incredible homemade soups, and the street meat surrounding the college always smells tantalizing, though I’ve yet to try any yet, and I definitely support my local fruit vendors…..but when it comes to a great sit-down, reasonable establishment that suits my style and decor and not one of an uppity east sider, it’s taken me a while. Luckily, I happened upon the “Follow Me Cafe” located on East 62nd off of Lexington. Now, it is not super-cheap…..nothing in this neighborhood really is, but the decor is awesome……very small, seats only 18 people, but it’s dark and comforting (you’ll be shocked by how deeply you sink into the cushions on the chairs!). The best part of this place is the food. 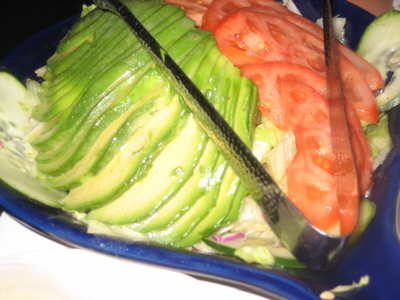 They serve fresh sandwiches and salads and wonderful crepes. It is not only open for lunch, it serves breakfast starting at 8am and serves food all day until around 10pm at night. The prices range from $8 through $13, but the ingredients are fresh and interesting, like goose pate with caramelized onions, or a panini with proscuitto, black mission figs, gorgonzola and rosemary oil. All sandwiches are served with a nice amount of organic greens and a lovely light salad dressing. When we went, we tried the balsamic grilled chicken with arugula, roasted bell peppers and avocado spread and the ratatouille crepe. Both were wonderful and the crepe was surprisingly large and filling. They have a lovely sweet crepe section for desserts and a nice menu with coffee drinks. Overall, I will definitely return to try other offerings on the menu and feel fortunate to have found a wonderful cafe with great food that does not make my skin crawl!